Bed sores are ulcers which occur on the skin when a person is bedridden, unconscious, and unable to sense pain, or immobile. Bedsores are also known as a pressure sores or pressure ulcers. Paralytic patients are especially at risk of bed sores. Anyone who is bedridden, uses a wheelchair or is not capable to change positions without help can develop bedsores. It is a common health problem in hospitals, nursing homes and in homes all over the world, where people are confined to their beds. The causes of bed sores include unrelieved pressure, friction, humidity; shearing forces, temperature, age, continence and medication. This disease can be controlled and completely treatable if early diagnosed. If medical treatment is not given at proper time, it can become critical, and in fact fatal. A bed sore develops when blood supply to the skin is cut off for more than two to three hours. As the skin dies, the bed sore first starts as a red, painful area, which eventually turns purple. If treatment is not given, the skin can break open and become infected. A bed sore can become deep, extending into the muscle. When bed sore develops, it takes much time to heal. Bed sores often occur in the buttocks area, or on the heels of the feet. Elderly individuals are at high risk of having bedsores because the skin usually becomes thinner with age. Also, superficial fat tends to shift away from the body surface to be deposited in deeper areas of the body. Bed sores can also develop when a patient is poorly nourished the vulnerability to bedsores increases. Numerous researches have shown that bedsores are more likely to develop in patients who have an insufficient daily intake of protein, vitamin C, vitamin E, calcium or zinc. Persons who have certain diseases like atherosclerosis, circulatory problems from long-term diabetes or localized edema (swelling) have an increased risk of bedsores. There are many signs that specify an infection has developed. These are thick yellow or green pus, a bad smell from the sore, redness or warmth around the sore, swelling around the sore, tenderness around the sore. Signs that the infection may have spread are fever or chills, mental confusion or difficulty concentrating, rapid heart beat and weakness. Bedsores fall into one of four stages based on their severity. In first stage, a pressure sore appears as a persistent area of red skin that may itch or hurt and feel warm and spongy or firm to the touch. In this stage, wounds are external and heal speedily after the pressure is relieved. During stage II, skin is damaged partially either in the epidermis, the outermost layer of skin, in the dermis, the skin's deeper layer, or in both. The wound is an open sore that looks like a blister or an abrasion, and the surrounding tissues may show red or purple discoloration. If immediate medical aid is provided, these sores usually heal rapidly. 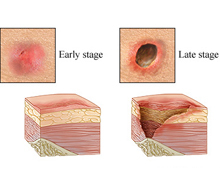 In stage III, bed sores damage the tissue below the skin, creating a deep, crater-like wound. Diagnosis For diagnosis of bedsores, doctor recommends some blood tests to check nutritional status and overall health. Depending on the circumstances, patient may have other tests, such as Urine analysis and culture, stool culture and biopsy. Treatment: Treatment is given by doctor according to severity of bed sores. It is difficult to treat once the skin is broken and may include removing pressure on the affected area, protecting the wound with medicated gauze or other special dressings, keeping the wound clean transplanting healthy skin to the wound area, medication (i.e., antibiotics to treat infections). Treating bedsores is challenging. Open wounds are slow to close, and because skin and other tissues have already been damaged or destroyed, healing is never perfect. Patients likely to receive care from nurses and their primary care physician, along with help from a social worker and physical therapist. When the condition is serious, patient may contact an urologist or gastroenterologist. And if a wound requires surgical repair, a neurosurgeon, orthopedic surgeon and plastic surgeon may be involved in treating patient. There are various non surgical treatments of pressure sores. Cleaning is advisable to keep wounds clean to prevent infection. Wound of stage I can be gently washed with water and mild soap, but open sores should be cleaned with a saltwater (saline) solution each time the dressing is changed. Controlling incontinence as far as possible is crucial to helping sores heal. If patient is having bladder or bowel problems, he may change his lifestyle changes, behavioral programs, incontinence pads or medications. For proper healing, wounds must be free of damaged, dead or infected tissue. There are many ways to do this. Surgical debridement is the one way in which dead tissues are removed by using a scalpel or other instrument. Surgical debridement is quick and effective, but it can be painful. Non surgical approaches include removing devitalized tissue with a high-pressure irrigation device (mechanical debridement), allowing body's own enzymes to break down dead tissue (autolytic debridement), or applying topical debriding enzymes (enzymatic debridement). Dressings are used to help protect wounds and speed healing. It depends on the stage and severity of the wound. The basic approach is to keep the wound moist and the skin surrounding it dry. Stage I sores do not need any covering, but stage II lesions are usually treated with hydrocolloids, or transparent semipermeable dressings that retain moisture and encourage skin cell growth. Other types of dressings may be more helpful for weeping wounds or those with surface debris. Contaminated sores may also be treated with a topical antibiotic cream. Another method is hydrotherapy. Whirlpool baths can aid healing by keeping skin clean and naturally removing dead or contaminated tissue. Muscle spasm relief is essential for both preventing and treating pressure sores. To help alleviate spasticity, doctor may recommend skeletal muscle relaxants that block nerve reflexes in your spine or in the muscle cells themselves. It has been observed that patient with the best medical care may develop bedsores to a point where they require surgical intervention. The purpose of surgery is to improve the hygiene and appearance of the sore, preventing or treating infection, reducing fluid loss through the wound, and lowering the risk of future cancer. Preventing bed sores: Bed sores can be prevented by regular inspection of the skin for areas of redness (the first sign of skin breakdown). Other methods of preventing bed sores and preventing progression of existing bed sores include frequent turning and repositioning, providing soft padding in wheelchairs and beds to reduce pressure, providing good skin care by keeping the skin clean and dry. If person can not look for bedsores himself, a family member, nurse or caregiver should check it. If an area of skin is red or discolored but not broken, keep pressure off the sore, wash it gently with mild soap and water, dry thoroughly, and apply a protective wound dressing. Contact doctor immediately if person notice any broken skin or open sores. Get immediate medical care if he has signs of infection: fever, drainage from the sore, a foul odor, or increased heat and redness in the surrounding skin. Nutrition: Patient must take a nutritionally rich diet with sufficient calories and protein and vitamins and minerals, especially vitamin C and zinc. These bitamines has been shown to improve wound healing. Healthy diet also protects the integrity of your skin and protects against breakdown. If patient is not well, recovering from surgery or living with paralysis, he may have low appetite and it is difficult to eat. 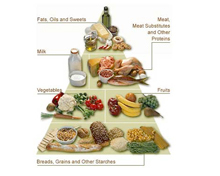 At this time it is necessary to get enough calories, protein, vitamins and minerals. He may contact dietitian to devise an eating plan that caters to patient food preferences while supplying necessary nutrients. It is suggested that patient should take smaller meals. If he never feel hungry, it's often helpful to eat according to a schedule rather than to rely on appetite. They must eat a larger meal when they feel hungry. Many people have their best appetite in the morning. They must take limit fluids during meals because liquids prevent from eating higher calorie foods. Prefer pureed or liquid meals. If patient feel trouble in swallowing, he must take soups, pureed foods or nutritional supplement drinks, which provide protein and calories but require little or no preparation. It may be easier for a person to drink rather than to eat something. Patients must take meal in a comfortable position. Raise the head of his bed to a comfortable level while they eat. Allow sufficient time for meals. Patient must need to change their lifestyle to get well soon. It is advised that they must quit smoking. They can take advice from their doctor about the most effective way to stop smoking. Tobacco use decreases oxygen to skin, robs body of vitamin C and slows wound healing. It is recommended for daily exercise which improves circulation, builds up vital muscle tissue, stimulates appetite and strengthens body overall. A physical therapist can recommend an exercise program tailored to needs of patients.